Journal of Pharmaceutical Chemistry & Chemical Science is an international, open access, peer-reviewed journal publishing original research & review articles in all the related fields of Pharmaceutical Chemistry and Chemical Sciences. The journal provides a comprehensive overview of the fundamental and applied aspects of pharmaceutical and chemical sciences. Journal of Pharmaceutical Chemistry & Chemical Science provides a new platform for the researchers, scientists, scholars, students in this field to publish their research work and update the latest research information to the scientific community. The Journal aims to publish high quality, diverse article as Research, Review, Mini Review, Rapid Communications, Perspectives, Editorials, and Letters to the editor. 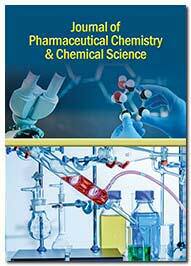 Journal of Pharmaceutical Chemistry and Chemical Science accepts articles from across the disciplines including but not limited to Pharmaceutical Technology, Pharmacognosy, Pharmaceutics, Biopharmaceutics, Pharmacokinetics, Molecular modelling, Pharmacology, Pharmaceutical Analysis, Clinical and Hospital Pharmacy, Drug design, Organic synthesis, Medicinal Chemistry, Pharmacoeconomics, etc.